Everything I bought on my way down to Windsor from Toronto is packed away, ready to be opened when I get home (probably proudly displayed next Thriftasaurus), so I am just going to do a small WHAT I DIDN'T BUY AT THE THRIFT STORE edition, but hopefully am able to see some great finds from everybody else! 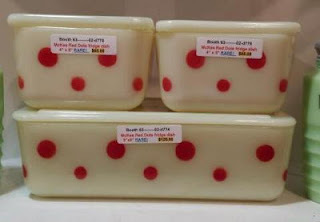 I totally would have bought this from the adorable packing if it were cheaper. 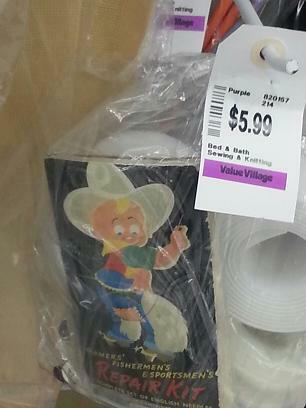 This particular Value Village prices have skyrocketed on anything "vintage" or collectable. They had a mini (cereal bowl?) that was Fire King, cheaper at an overpriced antique market by more than $1.50. 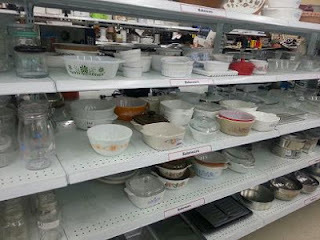 What most of Pyrex shelves looked like in most of the thrift stores I stopped at.. I am glad to see someone succeeded in their ambitions. If you remember my eBay post regarding my Strawberry Shortcake stationery (you can read about it on my blog)... can you believe once again I was bid in the last seconds by probably the same ditz with zero feedback? Even the person with 700+ feedback who bid, did not pay. What is the deal with Strawberry Shortcake stationery? I managed to sell one with a second chance offer, but my other second chance offer was ignored. 4 more non-paying bidder alerts filed... It's exhausting. Hiiii guys! I've been meaning to hold a follower appreciation giveaway for some time, I mean, if it wasn't for you guys, I probably would have stopped blogging long ago. I'd also like to thank everybody for making my weekly link party THRIFTASAURUS a success. I look forward to & love doing it every week. I know this isn't much, but I'm giving you pure Sir Thrift-A-Lot. A little Pyrex in the form of 4 Butterfly Gold napkin rings, 4 NOS napkins/hankies/linens by Drawing Board Greeting Cards, INC. (produced by Nakanishi & Co) - 100% Cotton & Made in Japan & lastly, a 1990 Mirage Studios Teenage Mutant Ninja Turtles: The Movie bumper sticker. I will be ending the Giveaway on June 15th, 2013 - 11:59PM EST. Please be a follower of my blog (you're here!) Sir Thrift-A-Lot. New followers welcome. You need to be a follower to win. Please comment on this post for an entry. If you'd like a second entry, blog about it & post the link in the comments section. I bet quite a few of you resellers are going to say the same thing as well, especially the ones who are purely Etsy sellers. Here's my vent. I don't list things often. Once in awhile, sure. To make some extra money. I listed some Strawberry Shortcake stationery from the 1980's, which always sells pretty well. This was the second time I listed it - the first being before Christmas. BOTH times a person with zero feedback bid within the last seconds of the auction, never paid & became a no longer registered member. BOTH times eBay deleted my auctions all together so I was unable to offer a second chance option (possibly that's to prevent shill bidding or whatever it's called). I have been hocking some Super Mario Bros stickers. I sold 3 lots. A person in Mexico claims to have never received. I was going to send with tracking again, but... according to Canada posts, it costs $88 to send with tracking to Mexico - $88 f*@#ing dollars! I told him forget it, take a refund like you wanted, eBay wouldn't find in my favour unless I resent with tracking anyways. Only about 10% of the time do they find in favour of the seller. So, the 3rd sale never paid. 50% of the recent auctions of mine, the buyer didn't pay. I had to go through the "non paying bidder" crap to get my final credit fee back. One allegedly they never got it, I don't believe they got it YET, but whatever. I am going on vacation soon & don't want the hassle of it on my mind. I like eBay for the quick sale. You can sell stuff you cannot on eBay. You seem to reach a larger audience. You get free auctions. I dislike how Etsy charges per auction. Thanks for reading/listening. My fellow bloggers, eBay & Etsy resellers are the only ones to understand. What the hell is wrong with people? I've been on eBay on & off for over 10 years.. back when you could of easily scammed people when you could still send cash in the mail. IT WAS NEVER THIS BAD. People are annoying f*@#ing scumbags. I understand why some people only ship within their own countries. I like to ship outside of Canada, I seem to think it maximizes my profits, but I guess this one is a lesson for me, only a $2.50 lesson, I have about 100 of these stickers, so really, I only feel like I am out shipping, but I could have used that $30. 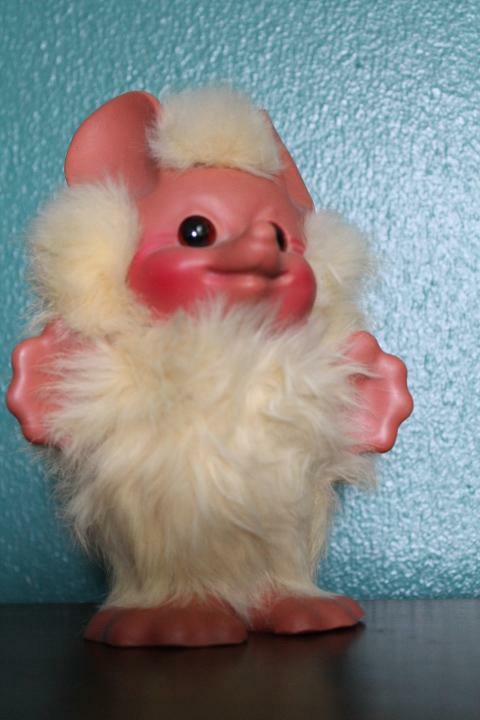 I really wish people would include Canada in their auctions, not just stick with the USA. I am thinking in the future, I might just stick with USA, Canada, but for stationery, a lot of people in Brazil seem to buy it.. I didn't live up to my name this week - Sir Thrift-A-Lot, I just went out once this week (still saving up some cash), but still found some nice stuff to bring home with me. I feel like the "thrift gods" are screwing with me. The Cosmopolitan is one of the Pyrex dishes that is on my list that seems to be obtainable at the thrift stores around here. I passed up a dish in Michigan on Boxing Day for like $10, thinking I'd never find a lid, now, look - I've got 2 lids, no dish! I did pick up these 2 red fridgies with unchipped lids, $2.99 for the pair. Also picked up a 470 spare lid. 2 vintage cards & a great pack of unopened, vintage Hallmark paper New Years coasters. I love the elephant. This is kinda a thrift regret, especially because the hair seemed to come out. Oh well. Vintage McDonald's pillow case. Pillow cases are pretty cheap in the thrifts, so you can usually make a profit on the McDonalds ones on eBay (if you come across them). When I saw these, I immediately thought of Van from ">Thrift Core. Anyways, Super Go-Bots from 1984 in the box. They have been taken out, $2 each. I am well on my way to having everything. You know all those people who say they have everything? Do they have a A ROUND TUIT? I never really thought I would & never intended too..
a vintage (never used) Holly Hobbie toaster cover, vintage Super Mario Brothers stickers & some different sets of 1980's Strawberry Shortcake stationery. Here's the linkup this week. Can't wait to see what everyone found! Like last week, I didn't do much shopping. I'm still saving up for my trip in a couple weeks. I did make my boyfriend drive me to one of my favourite antique markets, where they had a black 503 fridgie last time. It was $40 & a discount of 25% off last time. I had considered buying it. I was going to reassess the fridgie.. spoil myself. I deserve it. In the market, they were having a 20% off sale - what luck! & they fridgie was still there, whoa! I check the price.. the seller changed it from $40 to $50, despite the storewide discount, I couldn't do it after they marked it up since last time I was there. & one funny thing, yesterday when we were getting out of the car at a thrift store, I told my boyfriend "I feel like I'm going to find some money soon.. but I feel like it's only going to be $5." Well, today walking home from work, at University & Dundas, $5 folded up on the ground. Cool, eh? This cookie jar is by Otagiri. 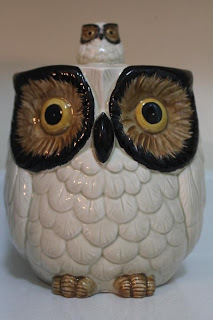 You know, everyone says it's from the 1960's, it is Made In Japan, but I know that other Otagiri owl stuff is from the very early 1980's (according to a date piece of owl Otagiri I have). What do you think? Anyways, got this at a thrift & the thrift haul photo above, the turquoise snowflake ($2.99), both without lids. 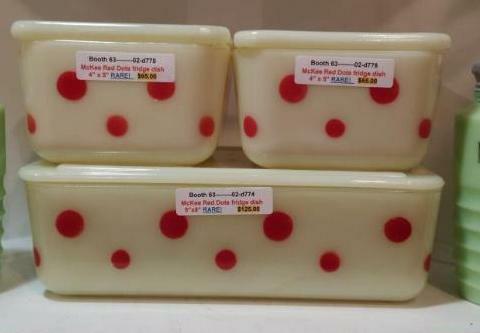 The Bake Serve & Store already has a lid. Give me awhile & so with the divided. Another motel keychain. Need more. I also got a Jello recipe book, just like one I've been looking for with original nasty recipes from the Jello mould boom. Although, it seems to have disappeared! And a set of mint condition Homestead cinderella bowls for under $7. IDK, future booth? Craigslist? Gift? We'll see.. Hoping you'll link up this week, so I can see what treasures you've found this week. I'll be linking up with href="http://www.alivingspace.com">A Living Space. I haven't been hitting the thrift stores too hard this past week - I'm going away kinda soon, have taken on an extra shift at work & I am saving some cash to hit up foreign thrift stores & antique markets to the dismay of my boyfriend. I picked this deer up at a thrift shop, same thrift shop I picked up the Spring Blossom Green Pyrex dishes. I was viewing retroresue's flickr stream after they commented on one of my flickr photos & came across the deer. I thought I would have a hell of a time figuring out what it is, but I guess not, guess it's a Jeannette powder jar. Funny, too. 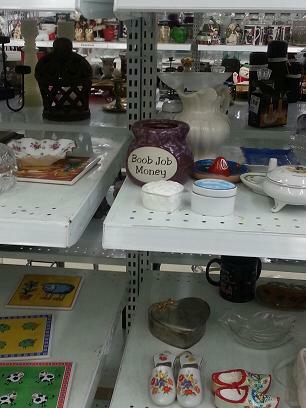 At another thrift shop, same chain, across the city, I saw the dog one, just the lid, priced a $1.00 higher. I've never seen a complete set of Fire King bowls (of this type). When I was heading to the books at a Goodwill, the clerk oblivious that I was there, wheeled the card out & stopped it right infront of me & walked to the front of the store. I came face to face with the bowls. I am really found of the grey one. I'm so bad at taking photos of stacked bowls... need to work on that! So here they are..
My research says that these glasses are from the 1940's. I bought a mint set of 6 for $3.99. A seller on Kijiji is selling this hula hoop children glass in red & black for $20 & online on eBay in yellow for about $15. That's it for me this week. A tiny trip planned for Friday, hope it yields something riveting. Is anyone else's Savers/Value Village now pricing Pyrex & the like like this? I know people complained on Facebook & looks like they do listen (about some things, anyways). A few of the stores have started too.. I haven't noticed at others because I haven't found any Pyrex there! Link up below if you've found anything at the thrifts, yard sales, estate sales, in the garbage, on the bus..